How do you hold drum sticks? 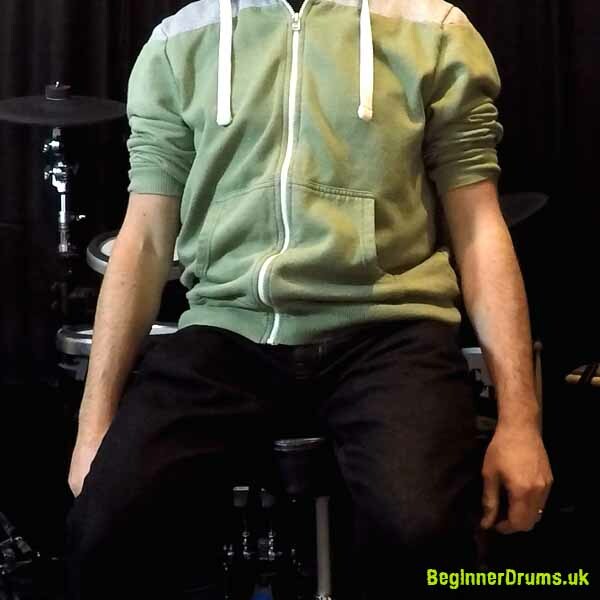 Beginner Drums guide! OK, so here’s the deal… I could probably write an entire web site just about hand technique on the drums. This is a BIG topic and one of the most important things to get ‘right’ from the outset. 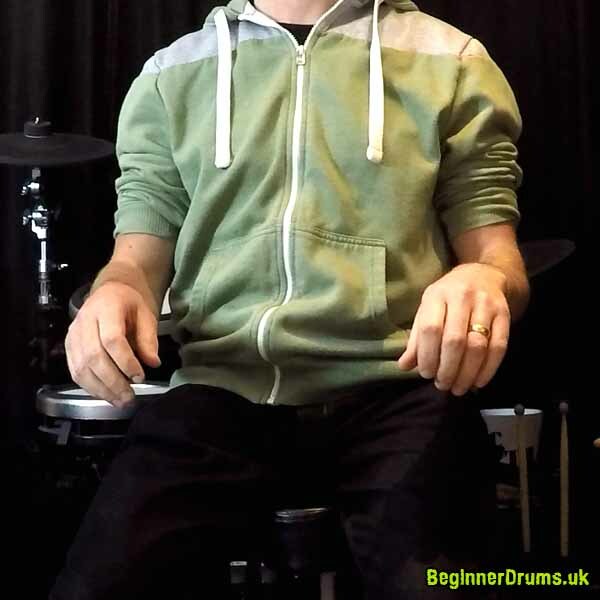 In this lesson we’re looking at how to hold drum sticks. I’ve come across countless students who have either been self taught or badly taught and don’t know how to hold a set of drum sticks. This is one of the most important areas where a teacher can make all the difference in terms of being able to see subtle issues or inconsistencies first-hand. But let’s assume that’s not an option and I’ll at least TRY to point you in the right direction… but bear with me as this is a tricky one to explain on a web site. If you flop your hands around you generally find they want to flop from the wrist. The wrist doesn’t move from side-to-side very easily but it naturally ‘hinges’ up and down. Try it – lift your arm up with the top of your hand pointing upwards. Now move your arm up and down and keep your wrist relaxed – your wrist should just naturally flop up and down to follow your arm. This is the motion we’re going to make use of when you hold a pair of drum sticks. Picking Up The Drum Sticks For the First Time! Of course you haven’t picked up your sticks and had a bash around yet, have you? Yeah right… 🙂 OK, put your sticks on the snare drum and leave them there for a minute. Sit on your drum stool behind your kit and dangle your hands at your sides. Shake out your arms at your sides and let them dangle. Remember, good posture, straight back, floppy everything else. Give your hands a little shake while they hang by your sides – they should be completely relaxed. The palms of your hands should be pointing behind you and the tops of your hands should be pointing towards the kit. Now, bring your lower arms up so they’re horizontal. It’s all about floppy hands! Start like this – totally relaxed. Why are your hands pointing up??! Did I say to stop being floppy?? 🙂 Put your arms back down and give them another shake out. Pick your arms up again, keeping your hands floppy. THAT is going to be your default playing position from now on so get used to it! Do it again, arms down, hands floppy, arms up, hands still floppy. TOP TIP: How would you hold a baby bird in your hand? You don’t want it to fly away and you don’t want to crush it. That’s how gently you should be gripping your drum sticks! 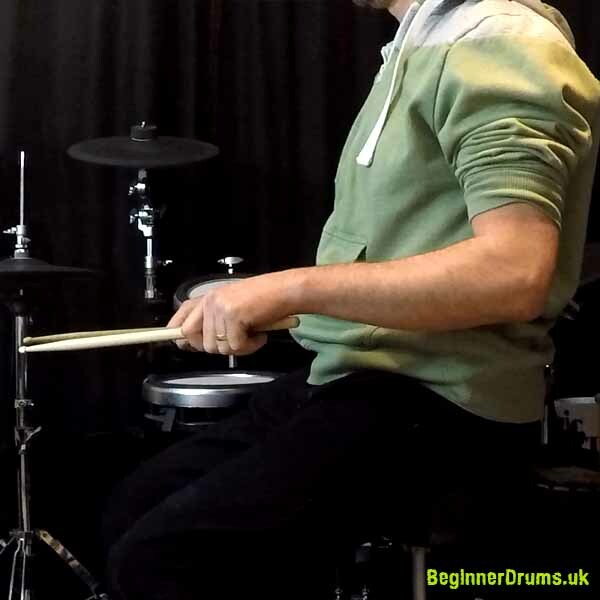 Keep your left hand in it’s ‘flopped’ position and use your right hand to put a drum stick in your left hand. Pick up the other stick with your right hand and copy the position of your left hand. If everything has gone according to plan your sticks should be pointing towards each other so the tips meet (but don’t touch) at roughly 90 degrees. You don’t need to get a protractor out. If your sticks are parallel to each other then you’ve either twisted your wrists so the back of your hands are pointing outwards… or you’ve dislocated something. Yes, I know, I know. There’s no ‘wrong’ way but if there’s a common mistake I see beginner players making it’s that the top of their hands are pointing outwards rather than upwards. If the top of your hand is pointing outwards then your wrist is hinging in a very uncomfortable ‘sideways’ motion. 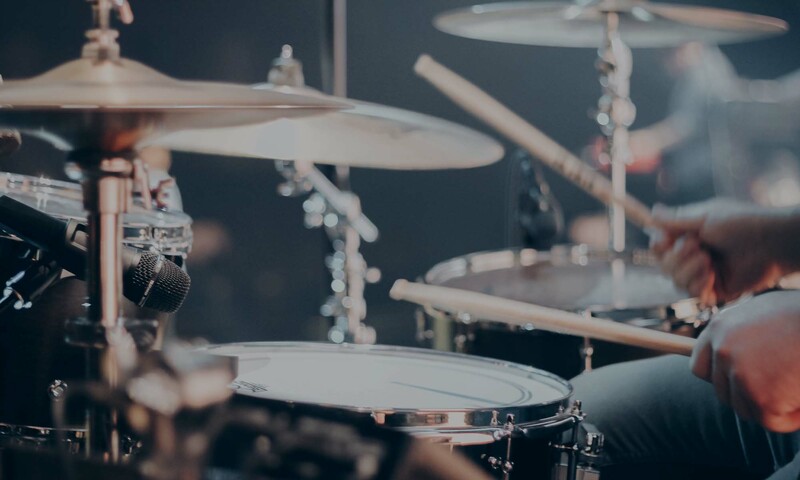 This uses WAY more energy and is generally a very inefficient way of holding the sticks – if you find you’re getting a sore arm while playing or generally lacking wrist speed, check yourself. Is the top of your hand pointing upwards or outwards? If it’s pointing outwards, try pointing it upwards and see what a difference it makes. Before anyone points out that many professional drummers play with the top of their hands pointing outwards, palms inwards. Yes… <sigh> this is another big subject. 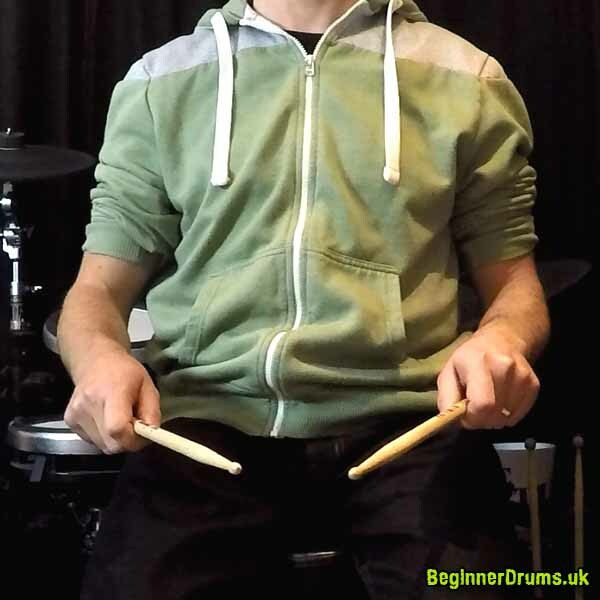 By having the top of your hands facing outwards your fingers naturally go ‘under’ the sticks and you UNLEASH THE POWER OF YOUR FINGERS!! If you can develop good finger control from an early stage, great. However for most beginners this will really complicate matters and unless you’re getting in to ultra-fast bebop jazz or speed metal you can survive without this for now. It’s awesome though… and if it’s something you want to develop in your own time, go for it!